Ada Mildy has become the first female member of the World Rugby Council. PHILIPPINE Rugby made history twice over as it got a seat for the first time on the World Rugby Council, where it will be represented by the council's first ever female member, Ada Milby. World Rugby is the international governing body for the sport of Rugby Union and is one of the leading sporting federations that supports a Gender Balance policy across all levels of governance. Milby, sister of actor Sam Milby, is currently the secretary general of Philippine Rugby. She made her international rugby debut in 2012 and was selected as the captain for the national women’s rugby team, the Lady Volcanoes, later that year. She served as the head of development for grassroots rugby in 2013, launching the Get Into Rugby program in the same year and was later nominated for the Philippine Rugby Board of Directors. Since 2013, Milby has continued to make waves across the rugby scene in the Philippines and Asia, and she is now looking to represent not only gender equality, but Philippine rugby on the global stage. “I’m so honored and humbled to be the first woman council member appointed for World Rugby Council following the strong support for Gender Inclusion at the highest level," shared Milby. "Not only does it create the space for more women leadership to be accepted at all levels of the game for rugby but it is a strong statement and call to action for other sporting codes to show that when you are fully committed to Gender Inclusion, the solutions may manifest in ways not previously considered. I applaud World Rugby and its commitment to continue building a game that is truly a ‘Sport For All,’” she added. The Asia Rugby federation was the first of the World Rugby regional associations to support the Gender Balance policy implemented by World Rugby. 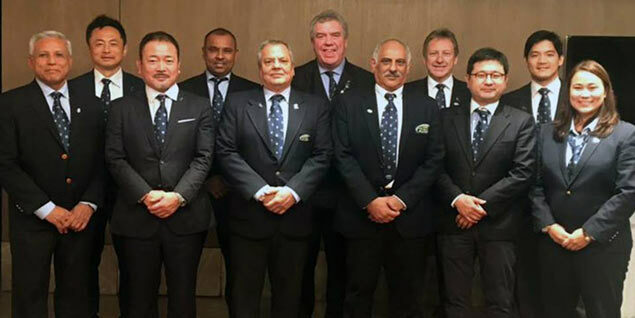 The association unanimously voted in favor for their Asia Rugby Executive Committee member to be the regional association’s first-ever female representative the World Rugby Council. World Rugby will appoint 16 more women to be filled following their decision to promote the International Olympic Committee’s target of a minimum 30% representation by women across all levels of governance. Rugby in Asia is on the rise, as Japan prepares to host not only the Rugby World Cup in 2019 but also the 2020 Olympic Games. Rugby 7s were re-included in 2016 which saw Fiji secure their first-ever medal at the Olympics. for the Philippines, she’s also inspiring younger girls to take up the sport and represent on a national level.” he added. The timing of the announcement is also ideal as the Philippines prepares to send its first-ever U17 Girls Team to the Youth Olympic Qualifiers in Dubai next week.